I found this hard to judge. I’m fascinated by Mexican art. They take the concept of wooden puppets, then turn them into a 3D animated digital versions. This allows them to have the breathtaking density and complexity of patterns and designs on the clothes. The non-human characters, the bulls, the gods, the bandits are grotesques. So it’s a visual feast in full colour. We had three kids with us, 11, 9 and 3 (4 after Christmas). The three year old found it hard to follow, though she concentrates perfectly through Tangled and Frozen, and did so six months ago, and understands the gist of both stories. Driving home I asked the older ones for their grading, if Tangled and Frozen are “10s”. They both disagreed and said Tangled and Frozen are “9”. One gave this 10. One 9.5. I was surprised they thought it THAT good. My issue with this is the cosmology, based around the Mexican Day of the Dead. Below the world is the bright afterlife Land of Remembered Beings, and below that is the cold and dark Land of Forgotten Beings. That’s why it is so important to remember and honour your ancestors on the Day of The Dead, so that they remain in the Land of Remembered Beings and don’t get relegated to the dark realm below. The two lands are presided over by demi-gods. The beautiful crimson-dressed La Muerte rules the Remembered realm, the black and green and treacherous Xibala rules the Forgotten realm. However, in the cosmology, the good and evil rulers of the underworlds are yin and yang – they operate together, they even show affection for each other (as far as a dead animated construct can show affection). I thought that quite a stretch for kids, because it’s an alien cosmology to us, though there are clear Heaven and Hell parallels. But they aren’t simply heaven and hell. 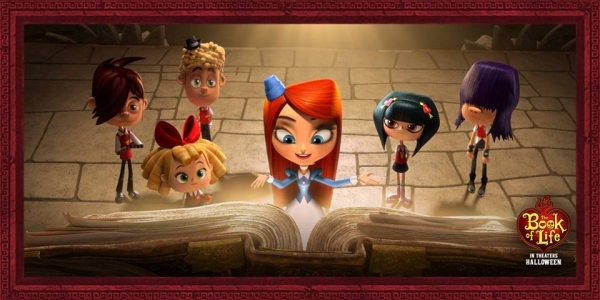 Add in the frame story, which is a bunch of obnoxious hey, dude high school kids visiting a museum, and being told the story of The Book of Life by a guide (no plot spoilers, but all becomes clear). These are those “outsize head” 3D cartoon characters beloved of American cartoonists … when we were doing American textbook art meetings, we saw reams of big head cartoon folios. it’s a style I heartily dislike. So we have the cosmology, we have the frame. On to the story which is about three kids growing up in the Mexican town of San Angel. Manolo Sanchez is the son of a bullfighter, descended from a long line of bullfighters, but he is much more interested in playing guitar, though he is exceptionally skilled and brave in the ring. Joaquin is the son of the town’s deceased hero, a soldier who protected the town from the bandits. He is a militaristic lad. Maria is the sloe-eyed beautiful girl. She is pretty feisty when it comes to sexist comments and assumptions, as well as handy with a sword, as are all female beauties in animations. OK, the boys compete for the hand of Maria. 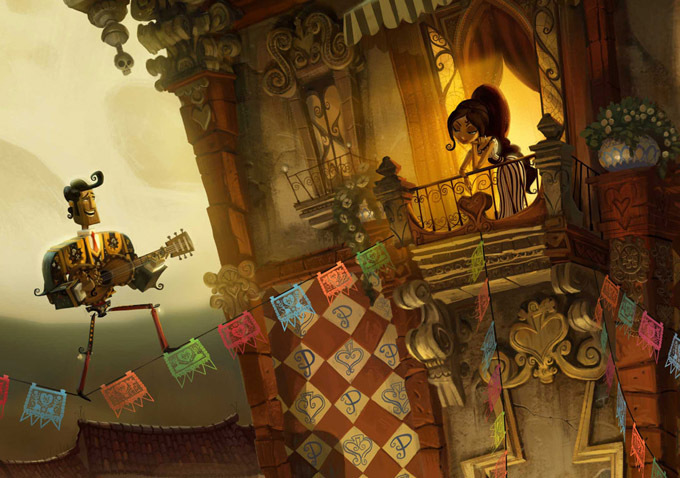 La Muerte and Xibala decide to wager on the outcome, with the prize being that if Xibala wins he moves up to the Remembered Beings land, and La Muerte goes down to the Forgotten Beings Land. I wish I’d been there to point out that she was on a poor bet – she got nothing for winning, and a serious relegation for losing. Maria has disgraced herself by indulging in a bit of animal lib, by freeing pretty pink pigs meant for slaughter. There’s an incident where Manolo proves his bravery, but because Maria didn’t see, everyone assumes Joaquin was the hero. Xibala, as Lord of the Underworld, or rather Sub-Underworld, gives Joaquin a medal which gives him total immunity from being hurt or killed. This enables him to grow up as a very brave soldier, as it would. Maria is sent off to Spain to a convent to fill out a bit and get more beautiful and the lads grow up. Manolo gives her a pretty pink porker as companion when she leaves. I said it doesn’t entirely make sense. By the time Maria returns, the boys have grown up. Joaquin is a heroic captain. Manolo an accomplished guitarist and singer with a comic band of Mariachis. There’s the big bullfight. Manolo is brilliant, but declines to kill the bull at the end, and of course only Animal Libber Maria applauds his compassion. (Hang on, I thought they killed bulls in Spain, but not in Mexico. Never mind, maybe this is where the Mexican form begins). Shenanigans ensue. Maria’s dad betrothes her to Joaquin. Manolo leads Maria across a candlelit bridge to a tree to serenade her, oddly enough with Elvis’s hit from Blue Hawaii in late 1961, Can’t Help Falling In Love. Xibala sends a snake across the lake. It bites Maria who apparently dies. Then Manolo gets bitten, dies too and becomes a skull-faced Remembered Being. Maria is not dead, but only sleeping, and is woken with a kiss by Joaquin. She agrees to marry him so he will fight the bandit leader and save the town. This means La Muerte has lost the bet. The demi-gods switch underworlds. In the Underworld, Manolo meets his ancestors, the generations of Sanchez bullfighters and his mum, Carmen. Thinking Maria dead, he sets off with mum and the disembodied head of granddad (don’t ask, they’re animated versions of wood puppets, it doesn’t matter) to cross the Cave of the Souls to rescue Maria who he reckons must now be a Forgotten Being as her name is not inscribed in the listing of the dead. Anyway, he meets the third demi-god, the Candlemaker, voiced by Ice T, who addresses the trio as y’all obviously. Someone has to create the candles to be lit on the Day of The Dead. They make a deal and Manolo is propelled back to the world of the living. Joaquin and Manolo unite to defeat the gigantic sized bandit (who was after the magic medal), and are friends again. Wedding bells for Manolo and Maria etc. It’s not that easy to follow, is it? In spite of gorgeous colours and incredibly rich detail, I only just about held on to the plot. Or maybe I didn’t. But the 9 and 11 year old loved it. Worth the visit. The 3D was sensibly subdued – no creatures shooting out to lick your face or sit on your hand. 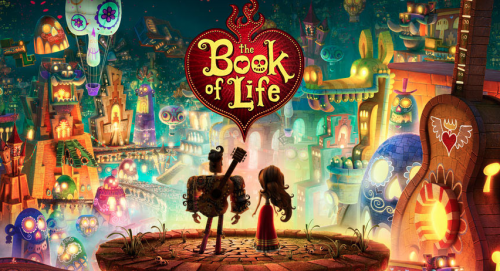 The title, The Book of Life, is a cop out. No doubt they thought The Day of The Dead lacked international child appeal. The story is Mexican, not even “Hispanic.” I feel that’s an issue in Britain. For example, I’ve seen celebrations of the Hindu Festival of Light and of Hannukah in primary schools here. It’s all part of a cultural widening. I can see that in America, similar exposure to Mexico’s unique mix of pre-Columbian and Catholic cosmology would be reasonably wide in schools, so kids would be at least one step forward in understanding the cosmology underlay. I suspect the love triangle with a bit of bullfighting, banditry and comic extra characters is transparent, and the cosmology works at a Good fairy / Bad wizard level, which is enough.